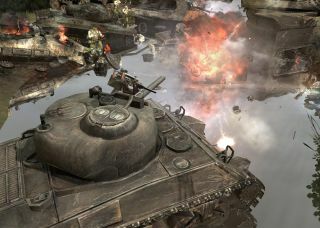 Here's the last in Relic's series of videos introducing the new units of Company of Heroes 2's upcoming multiplayer expandalone, The British Forces. This time, it's all about emplacements—that's your mortars, your anti-tank guns, and your AA. Basically, all the stuff designed to make other stuff explode. Company of Heroes 2: The British Forces will be out on September 3. For a further look at what it's all about, check out Ian's hands-on preview or watch the previous "Know Your Units" videos below.